The proper bed positioning is as important for comfort as it is for healing. 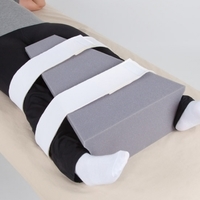 Whether you are looking for foot support, torso elevation or simply the right orthopedic support pillows, we have the perfect bed positioning product for you. Great for positioning lower extremities following hip replacement surgery. Small size measures 6" across the top, 12�" across the base and 18" long (15 x 32 x 46cm).